“Shame on you”, Westminster Tory Councillors! Central London was this evening the scene of another demonstration attended by hundreds of motorcyclists angry at the worse piece of anti-bike legislation ever seen on the planet, that is a parking tax imposed on a mode of transport that doesn’t congest and pollute very little compared with cars and other four wheel vehicles. At precisely 5pm, the No To Bike Parking Tax campaign sent a text message to all bikers who previously registered on its website to alert them of the meeting point for this demonstration. 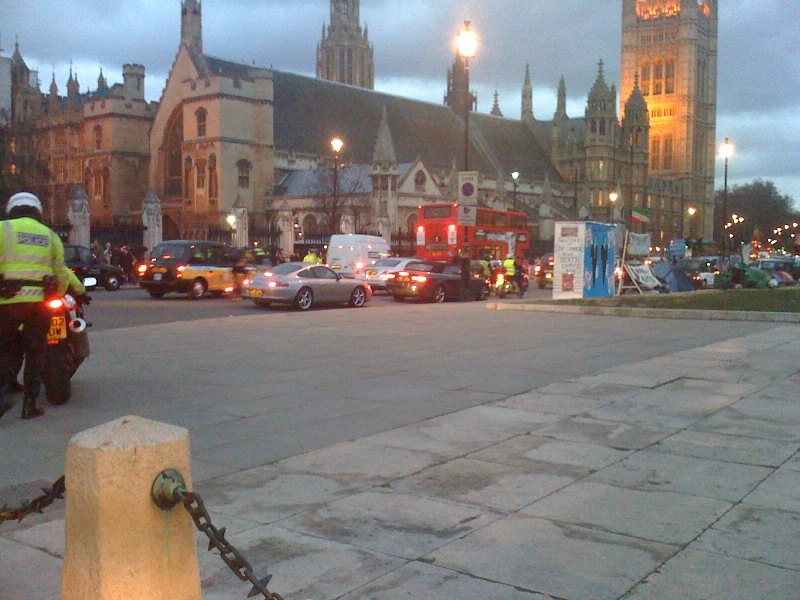 At 5.30pm, bikers gathered in Parliament Square for a slow ride around causing traffic gridlock within minutes. “NTBPT PRE-DEMO MEET – 5.30pm Tues 9 March, slow-ride around Parliament Sq – if gridlock ensues, so be it. Depart 5.55pm. Procession to Northumberland Ave for 6pm”, was the message sent by SMS to all registered protestors. Bye bye Boss, see you tomorrow! 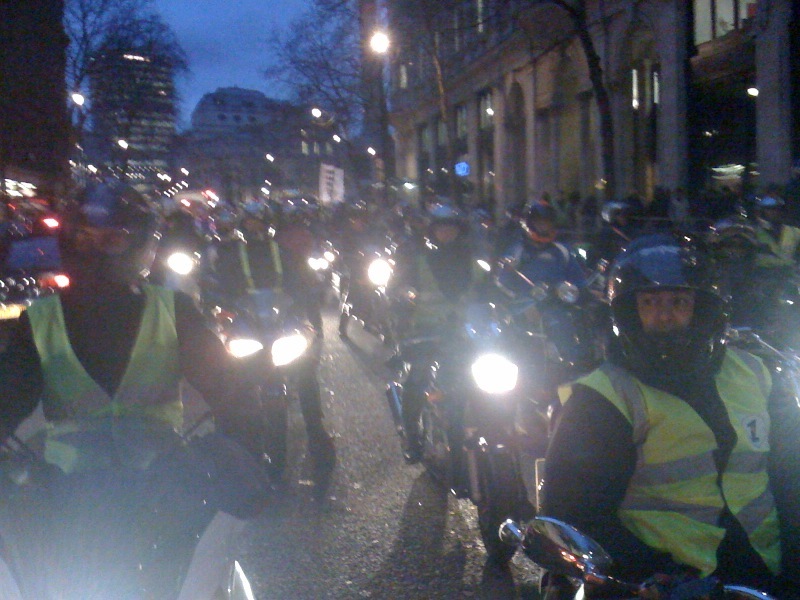 At 5pm, we rushed out of our office, took our bike in direction to Parliament Square. We just didn’t want to miss any second of a protest that was going to be so embarrassing for Westminster City Council. When we arrived at Parliament Square, there were already about 50 bikers riding around very slowly and causing a nice traffic jam, in which buses, cars and taxis were going to be stuck for a few hours by the time it would all clear. Came 5.55pm and we all followed Warren Djanogly, Chairman of the No To Bike Parking Tax campaign, to join him outside the Northumberland Hotel, where the Westminster Conservative fat cats and their guests (lords, dukes, ambassadors and mayors) were going to have their annual civic dinner at a total cost to the taxpayer of £23,000. Let’s not forget that Westminster Council has recently made 300 people redundant, has a £22 million budget overspend, has lost £17 million of taxpayers’ money in now failed Icelandic banks and has still gone ahead with a dinner party in one of the most prestigious venues in London for a total cost to the taxpayer of £23,000. Is this not disgusting? We are confident that Westminster residents will remember this on their way to the polling station this coming May. As Conservative Councillor Angela Hooper said “I think when it comes to guidance on policy, residents have that opportunity every four years”, they’ll no doubt take the opportunity to express their disgust at the conduct of some Westminster Conservative Councillors very soon indeed. 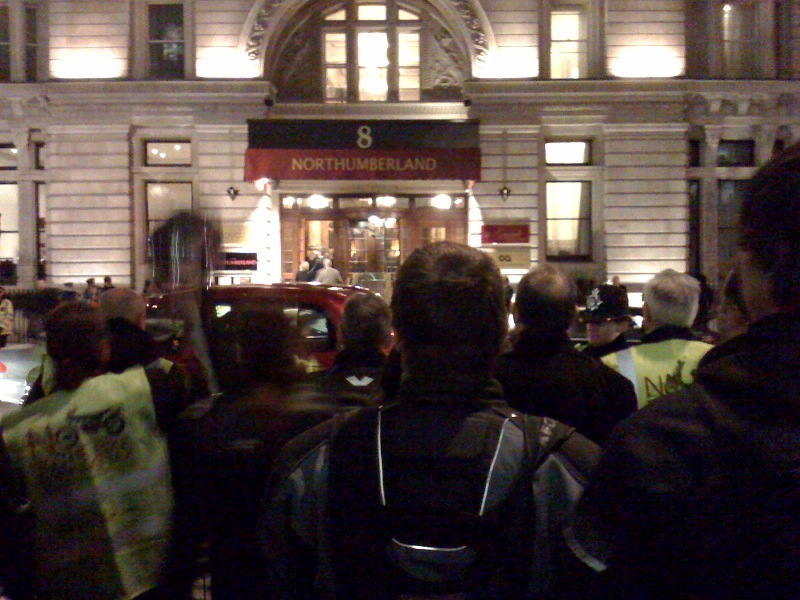 As Westminster Tory Councillors and their guests were entering the prestigious 5 stars Northumberland Hotel, they were greeted by hundreds of bikers and other protestors who shouted “shame on you!” at them. After all, we thought this was more than fair enough considering that it was OUR hard earned money these fat cats were spending this evening. Some guests were clearly unaware that they were going to be welcome by hundreds of bikers, as they looked so surprised when they saw us all shouting at them. Could it be that they had not been informed by their hosts that they were going to meet quite a few bikers on their way into the Northumberland Hotel? Maybe the hosts, who don’t have an issue with stealing thousands of pounds from bikers through a parking tax that may well turn out to be illegal, didn’t have the courage and courtesy to inform their guests beforehand of how the evening was scheduled to start? We were very pleased to see our most respected Westminster Councillor, Paul Dimoldenberg, protesting with us. It’s always nice to see that at least one person in that broken and corrupted Conservative lead council is honest and supportive to the public, so thank you so much, Paul! We were also very grateful to our well respected Catwoman for her delicious home-made cookies! Demonstrations without our Catwoman wouldn’t be so enjoyable. The fight against the Conservative motorcycle parking tax continues. As Warren Djanogly has now said many times, there is no more time for talking, it’s now radical action that is being taken against these Tory tax-makers. If you want to find out more, click here and here. Scrap the tax or scrap the tax makers! It’s as simple as that. Je ne pige quedale aux rouages du conseil de Westminster mais c’est degueulasse que les grosses légumes bouffent un gueuleton à ce rupin hôtel et les motards/scootards payent la douleurouse. Moi, je suis furibard !!!! I don’t know anything about how Westminster council runs its murky affairs but it is disgusting that they invite the affluent chosen few to “stuff their faces” at this celebrated “trough” & scooterists/bikers end up “weighing in” for the bill. I, for one am incandescent !! !